One of our favorite clients, Nancy, wrote the script below to help a friend of hers who lost her mother and is having trouble coping with it. I share it with hope that it will be an encouragement to others as well. People do not just visit Muir Woods. They come from around the globe to pay homage to nature in this cathedral of towering redwoods. The trees’ ages range from 400 to 800 years, and their height up to 250 feet. Flat easy-walking trails loop through the groves. Muir Woods National Monument was established on January 9, 1908 when President Roosevelt signed legislation to protect an old-growth coast redwood forest from destruction. Nature often offers metaphors more elegant than we can manufacture, and Muir Woods is no exception. When a big redwood tree dies, it creates an unusual sight. Small-growing, newly-sprouted baby redwoods grow in a circle around the charred stump. The burned trunk of the mother tree stand maybe six feet high, bu the trees surrounding it are young and healthy. The Park Rangers call these clusters, “The Family Circle”…The Mother Tree and Her Children. 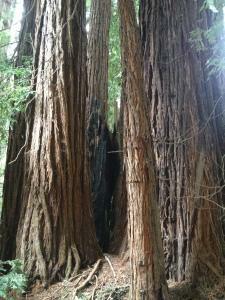 Redwoods have evolved to turn disaster into opportunity. In these coast forests, death produces life. In the redwood ecosystem, all seeds are contained in pods called burls. Burls are tough brown clumps that grow where the mother tree’s trunk and root system meet. When the mother tree is logged, blown over, or destroyed by fire, the trauma stimulates the burl’s growth hormones. The seeds release and trees sprout around her creating “The Circle of Children.” The children’s trees grow by absorbing the sunlight their mother cedes to them when she died. They get moisture and nutrients they need from their mother’s root system, which remains intact under-ground even after he leaves die. Although the children exist independently of their mother about ground, they continue to draw sustenance from her underneath. Appreciate the beauty of the earth, and the beauty within your mother. One day we are going to have to walk this earth without our best friend by our side, or them without us. None of us are going to be here forever. Our lives are just a taste of what Heaven is going to be like, when we walk with Jesus in perfection. Like the magnificent redwood tree, you mother lives on beneath everything you do. Her presence influenced who you were, and her absence influences who you are today. Our lives are shaped as much by those who leave us as they are by those who stay. Loss is legacy, insight is a gift, and towering memories are your precious guides. Enjoy your towering memories.